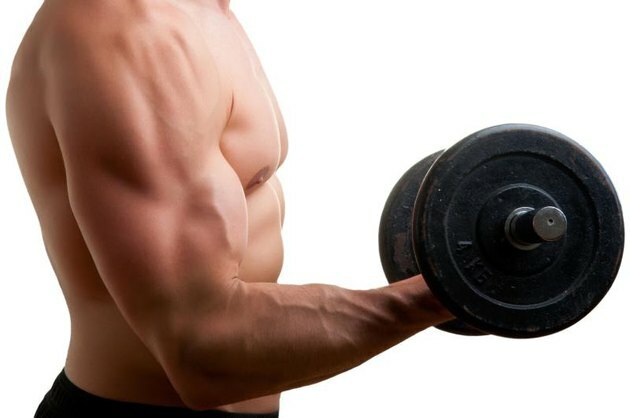 The way to increase muscle mass in your arms and chest is the same for building any other muscle in your body: high-tensity resistance training -- that is, weights -- supported by proper nutrition and recovery intervals. How to rev up the process? "You'll get there faster if you pace yourself and work at a sustainable level of intensity and not sidelining yourself with excessive effort," says Los Angeles-based personal trainer David Knox, author of Body School: A New Guide for Improved Movement in Daily Life. "That said, you can see significant results within six to eight weeks if you're diligent," Knox adds. There are so many machines and exercises for the chest and arms that it's easy to get overwhelmed. "One or two exercises for each muscle group is a reasonable place to start," says Knox. "Over a few weeks or a couple of months you can build up to three chest exercises and two each for shoulders, biceps and triceps. The real gym rats go for as high as four or five exercises per muscle group, but it takes awhile to get there." So where to begin? According to a study by the American Council on Exercise, the three best chest exercises are the barbell bench press, the pec deck machine and the bent-forward cable cross-overs. These and other exercises such as incline and decline presses and dumbbell flyes, primarily work the pectoralis major, which is the largest of the chest muscles. Not to be neglected, however, is the pectoralis minor, which lies beneath the pectoralis major and adds definition to the upper pecs. Biceps are usually at the top of everyone's list for building up the arms. Tops for working the biceps is the concentration curl, performed one arm at a time by curling a dumbbell with the upper arm stabilized against the thigh. Cable curls and chin-ups also top the American Council on Exercise's list of best bicep exercises. 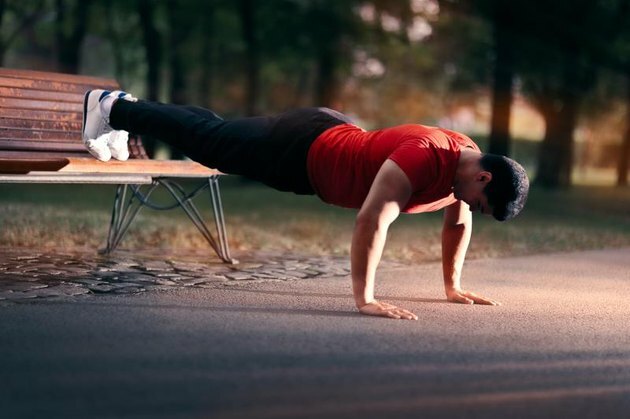 Keep it balanced by working those triceps -- the cluster of muscles at the back of the forearm -- with triangle push-ups which are done by placing the hands together so that the thumbs and index fingers form the shape of a triangle on the ground. Kickbacks and overhead extensions are other options for the triceps. The primary shoulder muscle is the anterior deltoid, the front-most of the three shoulder muscles. Build that up with the dumbbell shoulder press, but first do some work on the smaller and too often neglected posterior and medial delts with the 45-degree incline row and the seated rear lateral raise. To add muscle mass, you'll want to work with an amount of weight that maxes out your strength after six to eight reps. It's essential to bring yourself to the point of temporary muscle failure -- for 30 to 90 seconds -- before you can resume. Weight machines are excellent when you're testing your limits because they're stationary and won't fall on you when you're testing your limits. Speaking of limits, yours are likely to expand quickly in the course of your first several workouts. Keep adding weight to enforce overload at six to eight reps. If you're just getting started, aspire to one or two sets of each exercise and gradually build up to four to six. After all that effort, it's important to rest for at least a day between workouts because the real muscle building happens when the body adds new muscle fibers to repair the tiny tears and strains inflicted during the workout. Soreness -- also known as delayed onset muscle soreness, or DOMS for short, is a measure of progress. You should feel the burn but it shouldn't be debilitating. "If you're sore the day after a workout but most of it wears off by the next day or so, you're probably on the right track," says Knox. Building muscle conjures images of gigantic slabs of raw beef and endless protein shakes. While it is necessary to take in more protein than you use, massive amounts aren't necessary. The American College of Sports Medicine and the Academy of Nutrition and Dietetics recommend 1.2 to 1.7 grams of protein per kilogram of body weight for strength-training. If you don't want to do the math, the American Council on Exercise puts it at 15 to 35 percent of diet depending on your goals. So if you're building muscle mass, you might aim for the higher end of the range. Load up on one of those servings of protein, about 20 grams, after your strength-training session to take advantage of the immediate post-workout muscle-building window. ACE Fitness: How Much Protein Do We Actually Need? ACE Fitness: How Many Reps Should You Be Doing? A Push-Up Workout Is How Many Reps?